Deep blue cities and their inner suburbs came out for Barack Obama, pulling the president through in battleground states like Colorado, Ohio, Virginia, and Florida. And they put him so far ahead in places like Wisconsin, Nevada, and Pennsylvania that Romney never really had a chance (not to mention his home base of Suffolk County, Massachusetts, which went 78 percent for the president). Of course, this isn't a new phenomenon. In 2008, Obama took cities even more convincingly, allowing him to win North Carolina and Indiana as well. But America is only growing more urban, with cities that had been losing population since the 1960s finally starting to swell again. Eventually, fast-growing blue cities like San Antonio, Houston, and Austin could bring even the GOP stronghold of Texas within the Democrats' reach. In the long term, the stakes are high: Republicans could be relegated to permanent minority party status. Psychologically speaking giving good directions is a particularly difficult task. The reason we find it hard to give good directions is because of the "curse of knowledge", a psychological quirk whereby, once we have learnt something, we find it hard to appreciate how the world looks to someone who doesn't know it yet. We don’t just want people to walk a mile in our shoes, we assume they already know the route. Once we know the way to a place we don't need directions, and descriptions like "its the left about halfway along" or "the one with the little red door" seem to make full and complete sense. 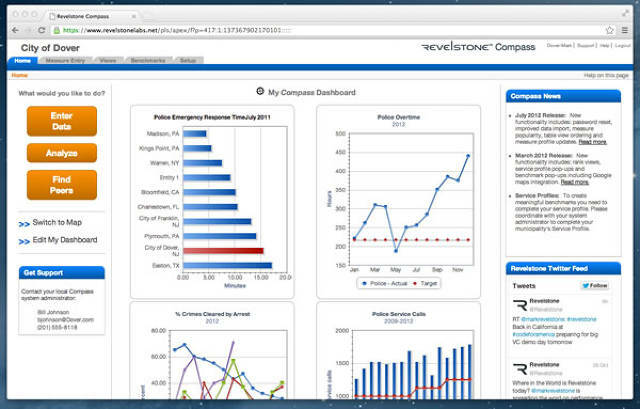 Revelstone’s software, Compass, lets municipalities track key metrics in a variety of areas, including sanitation, police, fire, and road issues. On the police side of things, for example, that might mean tracking the average response time to 911 calls and the percentage of crimes cleared by arrest. "The economy has been ruthless, and the new norm is do more with less. No municipality has the same resources they had in the past. They either cut down or find ways to get more efficient," says Revelstone COO Mark Nelson. "There’s a Moneyball effect going on. We need to turn our attention to tracking data and having data-driven discussions." The software helps government officials answer three questions, explains Nelson: how am I doing today, what could I be doing better, and what can I learn from my peers? That last point is important. In addition to providing municipalities with data analyses of their own performance, Compass also spits out the statistics of similar municipalities everywhere. It was about 24 hours till kickoff, and the Bills Mafia had taken over the Hotel Lafayette's bar in downtown Buffalo. They numbered in the 50s, though possibly there were many more. Other hotel patrons and passersby also wore Ryan Fitzpatrick jerseys and T-shirts with proclamations that said BE LOUD, BE PROUD, BELIEVE! Buffalo the team and the town, so long locked in a spiral of mutual hardship, seemed more culturally entwined than any other city and its professional sports franchise. I headed there during the run-up to the Bills' September game against New England, a festive time known locally as "Patriots Week." The Bills Mafia was observing the occasion by replaying the entire telecast of last year's Bills win over the Pats, watching the game with a holiday's gaiety, reflection, and thanks. Their celebration of the Bills was the third I had stumbled upon in two days. As early as Thursday, the game-day blimp already appeared to be pacing the skies overhead, as if personifying the teeming anticipation in the tiny-seeming people down below. I left mostly because the last of my friends, who had acted as a surrogate family, safety net and all around entourage, had left. And they left because there were not enough jobs in their field. Without them, the grinding, crushing poverty of the city became a starvation of the spirit that eventually drove me from my home. The challenges others might find disheartening—run down neighborhoods full of decaying boarded up haunted houses awaiting the wrecker’s ball, hollowed out downtown surrounded by snobbish know-nothing suburbanites, “the brain drain”, lack of resources so severe it lead me to describe life in the city as “living in a 150,000 person gypsy camp”—those things just added to the ineffable glamour of the city. My city. As they say, if you could make it here.